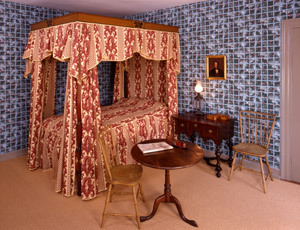 Stephen and Zilpah's bedchamber, 2002. On the second floor, the southwest room was the best chamber, elegantly decorated and furnished. Zilpah Longfellow, plagued by ill health, spent many hours here. The high-post bedstead with its painted oak-leaf cornice was made for the Longfellows by the Radford Brothers, Portland furniture makers, in January 1808. The bright red-and-yellow "Pompeian" bed curtains were the height of fashion that year. The reproduction of the original English cotton was based on the counterpane surviving from the set. Beds were among a household's most costly furnishings throughout the colonial and federal eras. A complete set of bed hangings included head and foot curtains, counterpane or coverlet, inner and outer valances, head cloth, and tester. Combined with the requisite featherbeds, bolsters, and mattresses, the cost of the textiles far exceeded the cabinetmaker's bill for the frame. When the family sought a new chest of drawers, Saco cabinetmakers Cumston and Buckminster provided an elegant veneered example. This stylish federal furniture was used alongside inherited colonial Massachusetts furniture. According to family tradition, the early dressing table and side chairs were brought to Portland by the Wadsworths in 1785. The young Henry Wadsworth Longfellow used the colonial tea table for writing, as his sister Anne related later in the nineteenth century. Although table tops often were covered with cloths to protect them, this top exhibits considerable wear. The Longfellows updated the woodwork and refurbished the wallpaper. In 1826 they installed the sophisticated French paper—a verdant bower with bright blue trellis—that remained on the walls until 1901.